Are You Buying Recycled Plastic Products? but what about recycled plastic products? It’s lightweight durability, ability to mold into any shape and cost have made it a popular material for just about every need. While it has it’s good points there are also some big problems. Our ever increasing demand for plastic means even more petroleum needed but as we have found one of biggest problems is the amount of trash created from discarded plastic. With a little looking though we can improve on this situation by buying items made from recycled plastic. 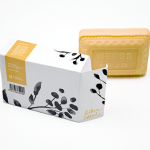 When we buy recycled plastic products we make a difference in several ways. We keep more plastic out of landfills. We encourage interest in finding new ways to recycle plastic. Less fossil fuels are needed to manufacture new items from recycled materials. Plus many recycling efforts provide income to people in need. All this just by buying recycled. We can limit our use of plastic but we can’t eliminate it’s use completely which is why we have to keep looking at ways to recycle it. Our recycling efforts have improved through the years and have come to include different kinds of plastic but when we see pictures of tons of plastic bottles, our most commonly recycled item, at garbage dumps we know we need to do more. While these efforts are providing the materials for many new and different recycled products not enough of us are either aware of the choices available or are choosing to buy recycled. More of us are paying attention to our purchases and we now know more about where a product comes from, what it’s made of, if it’s safe etc. and wanting to have an impact on the world around us we are choosing to let our money talk through our purchases. A good place to start is by buying recycled plastic products. Recycling plastic into new products has presented many challenges but as they are overcome new ways to use recycled plastic are being developed. Almost anything made from plastic could be made from recycled plastic. It’s not always easy to find but the next time you shop look to see if your items contain any recycled content. A large part of the pop bottles we recycle go into making fleece clothing, t-shirts, carpeting and other textiles. One of largest manufacturers of fabric made from plastic bottles is EcoSpun. For an interesting explanation of how plastic bottles can be turned into fabric check out their website. Eco Spun is used in making fleece for many different clothing companies. Patagonia, the large sportswear company has implemented a recycling program of plastic bottles and polyester to create their line of outdoor clothing. They also encourage sending in your old Performance Base layers to be recycled. In the market for printed items for advertising? T-shirts, aprons, tote bags, baseball caps all can be found containing polyester made from recycled plastic. Advertise your company or non profit and help the environment too. Recycled products has a big selection of recycled plastic products at affordable prices. Other recycled plastic products to consider are carpeting. The next time you are shopping consider looking for carpeting made from recycled content. Building for Health can point you in the right direction. Did you know that you can recycle your old carpets? Look to see if you have companies locally who can do this. These easy to care for and reversible indoor-outdoor rugs (pictured left) were handcrafted by Thai artists from recycled plastic bottles. Cool patterns and colors make these washable rugs a great addition to your patio. Their sturdiness makes them perfect for any area indoors that gets a lot of traffic. They are just a few of the many different designs available. 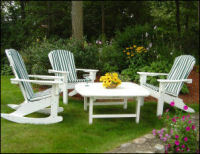 Beautifully designed patio furniture like the set below can be made from recycled plastic. It has many advantages over traditional choices. Items made from recycled material last longer than wood, require little maintenance, resist moisture, doesn’t crack or splinter and can’t be attacked by insects or rot. Recycled lumber can also be used in decking, fencing and children’s play equipment and this list will increase as more uses are developed. You can look for plastic lumber products locally or for a great selection online visit Atlantic Plastic Patio Furniture. 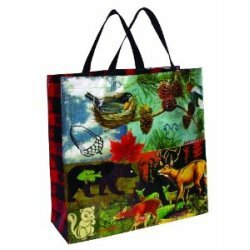 Handbags and totes are a great way to buy recycled plastic products. 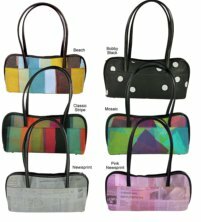 Global Girlfriend has a great selection of recycled plastic handbags, totes organizers and cosmetic bags made by Indian women using recycled plastic bags from garbage dumps in Delhi. Layers of plastic bags are fused together and the colors come from the bags themselves without any additional dyes. Check out their beautiful designs. 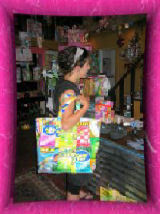 Reycled Plastic Totes from the colorful and funky to the retro and fun are being made by companies like Blue Q. Their unique and inexpensive handbags are made from 95% post consumer recycled plastic, using ethical labor standards and environmentally responsible manufacturing. 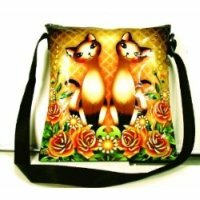 Monsoon Vermont carries interesting and fun recycled plastic products from umbrellas, shower curtains, totes, messengers bags and more. Recycled plastic at it’s most fun, creative, colorful and functional. They call it Trashion and it benefits the environment while helping to provide employment and a way out of poverty for many in Indonesia. Tips: How To Reduce Belly Fat for Teen Girls.